I am headed to Virginia Beach today for a week long meeting for work. Hello morning boardwalk running! In the meantime, here is my review of the Blue Ridge Half Marathon. The Foot Levelers Blue Ridge Marathon was held on Saturday, April 20 in Roanoke, VA. This year was the fourth year for the race. The race offered a full marathon, half marathon, and a 5-person marathon relay. All races started simultaneously at 7:35 AM. The race was timed using disposable chips. The half marathon cost $65 if registered before 12/31/12, $75 if registered by 3/10/13, and $80 if registered through 4/17. We signed up with an early bird special that took place shortly after the 2012 race, which was 50% off of the earliest registration fee of $65 (two for the price of one!!). The race expo was held the day before the race, on Friday, April 15, from 3-8 PM in the City Market Building in downtown Roanoke. The race organizers utilized the open area in the center of the City Market Building, that resembles the dining area of a mall food court. Packet pickup went very smoothly. They had the bib and t-shirt pick up area set up on one of the lofts. The loft had a stairway on each side, so participants went up using one staircase and went down using the other, which kept the minimal traffic flowing. The expo is very small and low key in comparison to other larger races, as this is a smaller (but growing!) race. It was not very crowded when we were there around 4:30 PM, but I know it became more crowded later on in the evening. There were a few vendor booths (Foot Levelers, Fleet Feet Sports, etc. ), a runners information booth, and a table set up for the “running legends”. As I have mentioned, Frank Shorter, Bill Rodgers, and Bart Yasso attended the expo, signed autographs, and also participated in a 5 person relay. The main sponsor of the race, Foot Levelers, was handing out shoe bags, which we used to put our stuff in. The race also hosted a pasta dinner starting at 6:30 PM, where all three running legends spoke. We did not attend the dinner, so I cannot give any input/opinion on it. I think it’s great when races offer this, though. It can be a great option for people traveling from out of town for the race, or for local folks who are interested. The race also offers race day packet pickup from 5:30 AM to 7:00 AM. The race has a small race packet that consists of your bib, the participant t-shirt, and a disposable chip for timing. They also had a table set up with handouts for upcoming local races, free Power Bar power gel samples, and noisemakers. As I mentioned, Foot Levelers was also handing out zip up shoe bags, which we used to carry our stuff. 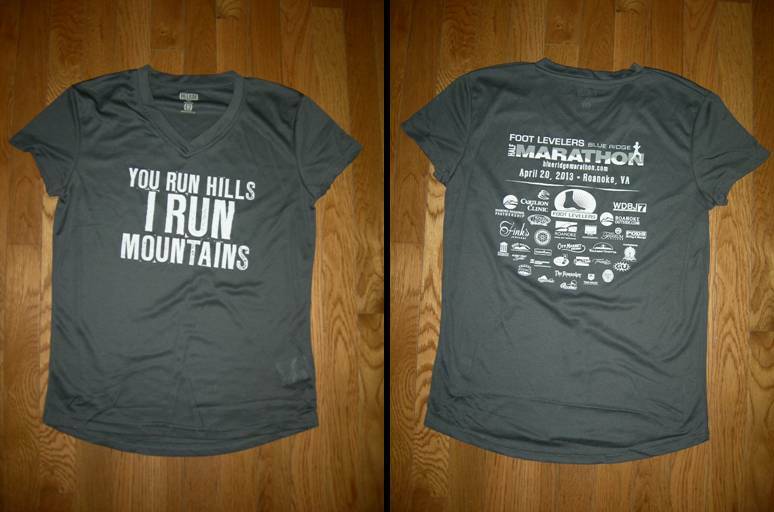 This year they had technical race shirts that were specifically sized for men’s and women’s. They also had a different shirt for the half and the full. In the past the race has had a unisex white cotton t-shirt that was not specific to the race you ran. I think it’s great that they have not only switched to a technical tee with m/w sizing, but that they also have race specific shirts. If you run the full, I think it’s important that you should be distinguished. The race medal this year was also improved. It still has a similar design to years past, but this year’s had some color on the medal. Both last year’s and this year’s medals were specific to the race you ran. Like the shirts, I think this is important and I really like when races do this. The 2012 medal had the word “half” in small vertical letters before marathon, but the 2013 medal actually has 13.1 on it. Here is a comparison of the 2013 medal and the 2012 medal (2013 on the left). We arrived in downtown Roanoke about 30 minutes prior to the race start. There was no traffic coming into the downtown area and we were able to park in the parking garage we had planned on without any issues. 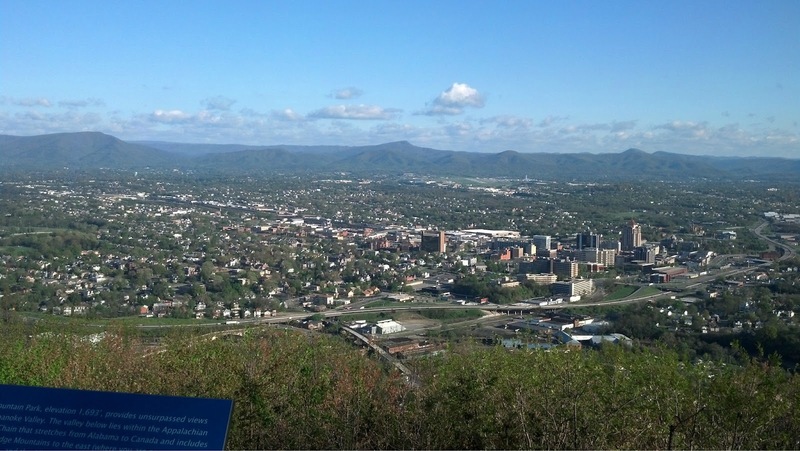 Roanoke has ample parking in it’s garages and lots, many of which are free on the weekends. There were at least five free garages and lots that are within two to three blocks from the start and finish areas. The race also offered complimentary bag check, which was close to start and finish and was quick and easy. We were provided with bag check tags to pin on our bags, and all I had to do was drop it off prior to the race. We pinned both my tag and Barry’s tag on the bag. He was able to pick it up after the race without any issues. There were plenty of porta potties located a block from the start line area. When we arrived there appeared to be a long line of at least 30 people (I know, not long compared to other races but this is a smaller race), but we waited less than 10 minutes. The course itself is beautiful, but challenging. 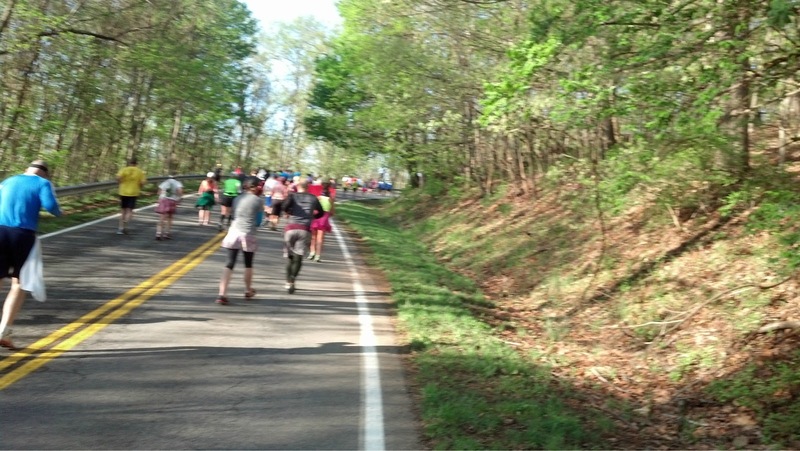 The first mile has some rolling hills and then miles 2-4 climb up Mill Mountain. Miles 5-6 bring runners back down the mountain, where they meander along the greenway and through neighborhoods as they make their way back to the downtown area. The second half of the race through neighborhoods and the downtown area has rolling hills with a few significant climbs. This year they had to make some last minute changes to the course, due to flooding on the greenway. The course was detoured from miles 9-11, which ended up adding some extra difficulty to the course with an additional 206 feet of elevation change. The race organizers handled this last minute change seamlessly. The course was clearly marked and there were volunteers and course marshalls (called “sherpas” because they are our “mountain guides”) making sure we stayed on course. The course had ample aid stations located every 1 to 1 1/2 miles. All had water, a sports drink called Heed, and porta potties. There was one gel station (I think it was power gel) for the half marathons at mile 7.5. The race also provided sliced oranges, gummy bears, and bananas a little before mile 4 and just after mile 10. There were also a few spectators in some of the neighborhoods handing out sliced oranges. Lastly, I can’t say enough great things about the volunteers (“sherpas”) on the course. They did a wonderful job this year, just like last year. The aid stations were well staffed and they were amazing cheering on runners while providing fluids and snacks. The finish line area is well organized. I did not actually go through the food line, but I saw that they were offering a variety of foods, including: bagels, bananas, pizza, shrimp, and power bars. They also offered bottled water, chocolate milk, and sodas (Coke, Diet Coke, etc.). The finish line area also offered free massages. The race also coincides with the final day of the Down by Downtown Roanoke festival, so there is live music at the finish line as part of that festival. This race has a few special touches. For one, the race director stands at the finish line and either high fives or shakes the hand of every finisher who crosses the line. This year the race also offered a contest for two people to get to “run with the legends”, where the two winners would get to run with Frank Shorter, Bill Rodgers, and Bart Yasso as part of a 5 person marathon relay. Also new this year, one of the local news stations provided live coverage of the event. We recorded it and it was really neat to get to go back and watch the highlights of the race. I think they had 35 personnel covering the race, and had them stationed at numerous locations throughout the marathon and half marathon courses. One other neat touch that this race has is the age group trophies, which are presented to the top three male & female finishers in each age group for the half and full. I think the top 3 relay teams in each division (men’s, women’s, and mixed) also receive trophies. The trophies are fashioned out of railroad spikes that are donated by Norfolk Southern. Students in the Welding/Motorsports Program at the Burton Center for Arts and Technology are the ones who form them into the trophies. Roanoke has a lot of ties to the railroad industry, so it’s a neat touch. The race also had an extra challenge thrown in this year for the full marathoners called “King & Queen of the Mountain”. The first male and first female to the top of Roanoke Mountain (around mile 7.5) are crowned the 2013 King and Queen of the Moutain. They receive a free pair of shoes from Fleet Feet Sports, a King/Queen of the Moutain shirt, and “possibly a crown” (direct quote from the race website). Overall a great race. I give it a 9/10. Do you prefer Saturday or Sunday races? What kind of “extra” stuff have races had that you’ve run? What types of special touches do you like a race to have? Congrats on a great race (and recap)! I hope your legs are recovering well. I love Saturday races for the obvious reason… a rest day before heading back to work! I haven’t run the Annapolis Ten-Miler, but they give out great swag! One year they gave out a watch, one year running pants, and the next year the matching jacket (or vice-versa). Thank you! My legs are feeling okay, surprisingly. The upper parts of my quads are sore, as well as my hips and lower back, but that’s about it! Wow sounds like the Annapolis race has some awesome swag! You’ve sold me on it for next year!! I hope you are thoroughly enjoying a recovery week on a beautiful boardwalk! Really good review! If I didn’t know about it already you would’ve convinced me to run! Maybe we can meet up at another local race soon?? Thanks! My intention wasn’t to persuade someone to run this race, but to give my opinion on it as well as information about it. I’d love to meet up! I try and keep an updated list on the left panel of my blog that lists upcoming races. Feel free to drop me an email if you see on that you will be at, too, and I will do the same if you mention one on your blog that I’m going to be running. Wonderful recap Meagan. We truly appreciate it. Thanks! And thank you for a great race. See you next year!